Gregor Townsend is delighted that Glasgow Warriors revived their European Champions Cup chances but faces injury problems ahead of facing Edinburgh. After the 9-6 win over Scarlets, the coach turns his attentions to a derby double header in the Pro12. 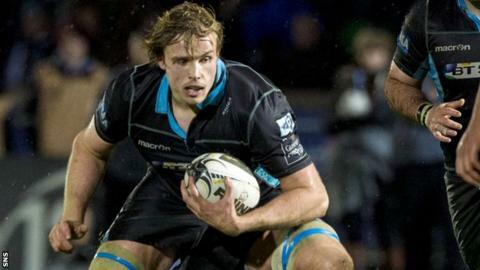 But captain Jonny Gray and Mike Blair picked up concussion in Wales, while Rob Harley was taken to hospital. "We know that if we win all our games then we'll be in a very good position and could qualify," said Townsend. "We know we have three massive games ahead of us - Racing and Northampton away then Racing at home." With Northampton and Racing 92 drawing 9-9 on Friday, Glasgow are now only three points behind the French side and one adrift of Saints with a game in hand over the English side. "If Racing had won that, they would have been clear favourites for the group, but it means everybody is quite close now," Townsend told BBC Scotland. "We've played three games and we've got a game to catch up and it will be a tough one away to Racing, but we're back in the mix." Townsend was "proud" that his side had overcome the Pro12 leaders in terrible conditions and despite playing part of the match with two players off the field following yellow cards. "We made it difficult for ourselves, but we've done that before this season," he said. "We've done it before going down to 13 men. "The important thing was what they did to win the game. They showed a lot of determination, a lot of courage. "They were putting bodies on the line, there were a few injuries, and they showed great character and showed how much that game meant to them." Townsend reported that forward Harley has a dislocated thumb, but it has still to be decided if it will require surgery. Centre Alex Dunbar will also be assessed after picking up a "hamstring twinge". Glasgow next face Edinburgh in the first leg of the 1872 Cup on 27 December in front of what is expected to a crowd of more than 20,000. "It is fantastic to play Edinburgh over Christmas and New Year," added Townsend. "We are playing for a trophy against our closest rivals back-to-back in front of big crowds, so it will be great to have this change of focus. "We will be determined to win that trophy back, but we know Edinburgh are better than they were last year. "We have been working on how we can beat this Edinburgh defence because it has been the number one defence in the league this season."